Calvin Klein it’s not. The advertisement shows men crawling through mud and under barbed wire, being smacked in the head with padded fighting sticks, vomiting after inhaling tear gas and diving, boots and all, into a swimming pool. If it sounds like a teaser for a survival reality show, that’s not far off the mark. On Saturday, the Marine Corps will unveil its newest advertising campaign, and unlike past campaigns featuring the Marines’ stately Silent Drill Platoon in dress uniform, the new spot highlights in high-definition detail the grit, sweat and tears of boot camp. The article goes on to point out that economic downtimes have allowed the Corps to meet its recruiting goals not only for 2009, but for the next three years. So, the Marines figure they can be picky. They can afford to give a more accurate representation of what Marines will go through, at least in the process of becoming Marines. A bracing exposure to the realities of what's involved for those who make a commitment to join up will undoubtedly cause some to opt out of the service and will probably incite others to sign on. This development particularly caught my eye because, in working on next Sunday's sermon, I've been considering what's involved in being a disciple, about how we in the Church sometimes sugar coat things, trying to be palatable to our world, trying to make following Jesus like a trip to Walt Disney World. Jesus never does that. Yes, Christ has done all that is necessary for us to be forgiven our sins and to have life with God forever. The grace of God, given through Christ, is amazing. But though grace is free, it isn't, as the martyred German Lutheran pastor Dietrich Bonhoeffer wrote, "cheap." Jesus says, "Whoever loves father or mother more than me is not worthy of me; and whoever loves son or daughter more than me is not worthy of me; 38and whoever does not take up the cross and follow me is not worthy of me" (Matthew 10:37-38). He goes on to say, "Those who find their life will lose it, and those who lose their life for my sake will find it" (Matthew 10:39). In the Gospel lesson for tomorrow, Jesus says, "Whoever wants to be first must be last of all and servant of all" (Mark 9:35). If your hand causes you to stumble, cut it off; it is better for you to enter life maimed than to have two hands and to go to hell, to the unquenchable fire. 45And if your foot causes you to stumble, cut it off; it is better for you to enter life lame than to have two feet and to be thrown into hell. 47And if your eye causes you to stumble, tear it out; it is better for you to enter the kingdom of God with one eye than to have two eyes and to be thrown into hell, 48where their worm never dies, and the fire is never quenched" (Mark 9:43-48). The free grace of God can only be grasped by faith or trust in Christ, the giver of grace. "For by grace you have been saved through faith," the first century Ephesian Christians were reminded, "and this is not your own doing; it is the gift of God..." (Ephesians 2:8). "For God so loved the world that he gave his only Son, so that everyone who believes in him may not perish but may have eternal life...Those who believe in him are not condemned; but those who do not believe are condemned already, because they have not believed in the name of the only Son of God" (John 3:16-18). In other words, it's a matter of trust. Do we trust in anything more than we trust in Jesus or do we trust in Jesus and His grace? Jesus doesn't mean that we are literally to cut off hands, feet, or eyes, of course. But He does mean to show us what trust, faith, is like and how hard the way of faith can be. The way of faith in Jesus Christ, of course, brings incomparable comfort, hope, and peace. But it also calls us away from our dependencies on the dead, dying, finite things of this world. Christ calls us not just to let go of those things readily identifiable as sins--the misuse of God's Name, murder, thievery, sexual intimacy outside of heterosexual marriage, and so on. Christ also calls us to let go of otherwise good things--things created by God, things which, when used, in the right places at the right times in the right ways are good--if those things keep us from trustingly grabbing grace. That's what faith is: grabbing God's grace. And if you think that's easy, then you know nothing about faith. The father who approached Jesus for exorcism for his son knew how difficult faith is. Jesus told the man to believe, to trust, in Jesus. "I believe," the man confessed, "help my unbelief" (Mark 9:24). The man knew that grace is free, but that the faith needed to apprehend grace is hard. Fortunately, God knows how hard faith is for us, too. Psalm 103:14 tells us that God, the inventor and giver of grace, "knows how we are made; he remembers that we are dust." God is charitable. As with that man who approached Jesus on behalf of his son, all who approach Him in honesty and openness, who want to believe will find a remarkable thing happen to them: God will begin to build faith--trust--within them. On the first Christian Pentecost, after Peter said that the sins of the world had necessitated Jesus' death on a cross, his fellow Jews asked him and the other disciples, "Brothers, what should we do?" (Acts 2:37). They knew that they were holding onto sins and the world more than they were holding onto God, that they were holding onto the blessings of God as though they were more important than God. How could they be free to grasp the hand of grace extended by God through Jesus Christ? "Repent, and be baptized every one of you in the name of Jesus Christ so that your sins may be forgiven; and you will receive the gift of the Holy Spirit," Peter said (Acts 2:38). Marines willingly submit their bodies and minds in service to their country, government, and commander-in-chief. Anyone who would follow Jesus--and take up the gifts of grace--is called to submit--body, mind, soul, and all--to Him. A bystander said, "Master, will only a few be saved?" Of course, no one has perfect trust in Christ when they're presented at the baptismal font...or when they're confirmed. Nor will any of us have perfect trust this side of the grave. Christian faith is a journey and God promises that if we are willing to make that journey, He'll not only mark the pathway, He will give us all that we need to make it. God knows that, we are incapable of even confessing faith without His help. "No one can say, 'Jesus is Lord' except by the Holy Spirit" (1 Corinthians 12:3). Following Jesus costs all Christians their lives. The Christian life isn't about personal fulfillment, though that may very well be a side benefit. It's about being in sync with the God Who made us, loved us, and wants us to be with Him forever. That will most certainly put us at odds with the world--including our families and friends--repeatedly. It will even put us at odds with ourselves. I've been a Christian for thirty-three years now and I still daily struggle with my sins, with my desires to call the shots in my life, with my personal ambitions. I wonder why God insists on doing things in ways other than what I prefer! Pastor Brian Stoffregen puts it well when he writes, "It may be that a believer or a congregation that seeks to avoid any difficulties..." seeks to avoid the very things that God wants them to go through in order to preserve and strengthen their faith, their trust in grace. I'm a recruiter for Christ. I hope that all people--all my fellow sinners--will follow Christ. Keep in mind though: Grace is free, but it isn't cheap. Church: A Place Where the Lonely Find Community? What gives Church a bad name is when people come searching for community and it's not that a particular congregation is a "bad match" as much as there is no authentic community to be found unless you have already been there for a generation, or already know people, or look/act a certain way. When people leave church lonelier than they were when they arrived, it's not good. So who's lonely in your church? John Schroeder quotes three stunning paragraphs from another blog. Read them and John's reflections, then go back to the original piece to which John links. "The fountain of the spiritual life is humility, not self-love." That's a great challenge to today's watered down, hope you're feeling good about yourself, grace without faith, redemption without discipleship, pseudo-theology. The fountain of the spiritual life isn't what I feel. It isn't what I think. It isn't what I have experienced. It isn't undue regard for what "my journey" has taught me. It's humility before what God has already done in Creation, in Israel, and, above all, in Jesus Christ. It is humility before the immutable call to repentance. It is humility before the reality of grace. It is humility before a faith which I could never manufacture, but which a gracious God creates, fosters, and deepens in the life of those willing--like the man who prayed to Jesus, "I do believe; help my unbelief"--to let God dispossess us of our self-love and replace it with faith, trust no tin self, but in God in Christ. It is a faith that allows me to do what I could not otherwise do, grasp the grace that would otherwise elude me. Grasp the Savior I could not reach were He not reaching down. Forgive me for all the ways in which I have failed to live my faith, Lord Jesus, and help me to follow You in the future. "The fountain of the spiritual life is humility, not self-love." It is forever and forever, humility, the only sensible attitude by which to face a holy, perfect, blameless, crucified, risen, compassionate, just God. I have seen such humility in others, but never yet touched the hem of its garment. But still I follow, willing to be what I can't make myself become, willing to be what only Christ can make me. Willing, Lord. At least my spirit is. Make my quaking, self-serving, self-aggrandizing, self-absorbed, self-obsessed flesh willing, too. Mary Travers has died at age 72. Her group, Peter, Paul, and Mary, were often scorned by folk purists who disdained their popularization of the folk idiom in the early-60s. But there can be little doubt that the group's harmonies opened mainstream US society folk, with its long history of advocacy for civil rights, unions, and peace. In the 1970s, Travers hosted a radio show syndicated for broadcast on Album Oriented Rock (AOR) stations. The guest on her first show was Dylan, who had apparently accepted Travers' invitation out of deference to the important role Peter, Paul, and Mary had played in his career, because Dylan wasn't giving many interviews in those days and when he did, he left things as oblique and uncomfortable for the interviewer as possible. Grateful or not, Dylan still insisted on giving, in turn, dadaist or nearly confrontational responses to Travers earnest attempts at conversation. It all started badly when Travers told Dylan how much she'd enjoyed his then-latest release, Blood on the Tracks (1974), an LP that largely chronicled the break-up of his first marriage. Dylan didn't accept the compliment, telling Travers that he found it hard to understand how anybody could enjoy that much pain. Maybe she hadn't "enjoyed" the collection, Travers responded uncomfortably. Maybe "appreciated" was a better word. 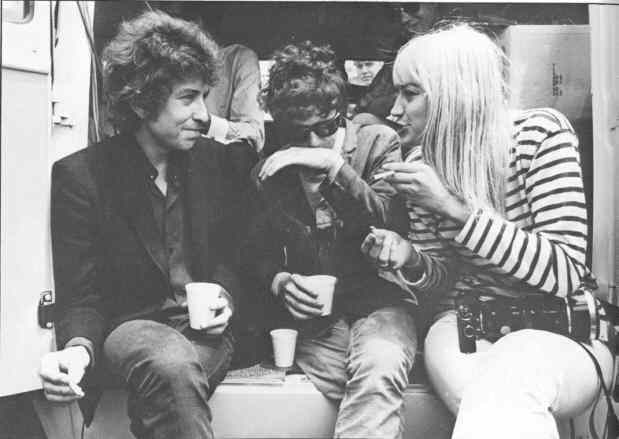 Later, Travers tried to engage Dylan in a discussion about songwriting. "Do you write songs?" Dylan asked, reversing roles on Travers, once more adding to her discomfort. She explained that she wrote poetry and discussed it at some length. Dylan's response: "Uh huh." I couldn't help thinking of that interview when, some years later, it was announced that Dylan would host his own satellite radio show. But you can bet he would never leave himself in the position of being as vulnearble as Travers did thirty-five years ago. But that seems evocative of the same admirable quality that led to Peter, Paul, and Mary's success. Travers never aspired to be a professional singer, but one thing led to another. No master plan, just a girl with a voice, who sang the next song she was asked to sing. Though Dylan may have been too cool and egotistical to overtly acknowledge his debt to P, P, & M, they cleared a path to the mainstream not only for folk music, but also for the political sensibility that was so important in Dylan's music and that of so many others. God give comfort and peace to Mary Travers' family. "...It is time we practiced it radically." I love this piece of advice shared today in the daily emailed inspiration from my colleague and friend, Pastor Glen VanderKloot. Pray for the first two minutes. The first two minutes of what? The first two minutes of everything! The first two minutes of your day. The first two minutes after you get in the car. The first two minutes at work. everything will help you to stay connected to him. Last week on my day off, I took a nice afternoon nap. After about an hour's sleep, I awoke and a name immediately popped into my mind. It was the name of a woman who graduated from seminary several years ahead of me, some twenty-eight years ago. I've not had contact with her in about ten years, have had no conversations about her, and hadn't even heard her name in all that time. "Why did I think of her name?" I wondered. No matter, I decided. This was a good reason to pray for her and, if I could find her address, send an email to her way just to let her know that, as the result of the strange emergence of her name in my sleep-fogged brain as I awoke, I had prayed for her. I prayed, "Lord, whatever it is that X needs, provide for her needs. Bless her and give her a sense of Your love for her." That night, I also included her in my bedtime prayers. Then, I sent an email to X. A day later, I received a reply, "Thanks for the Prayers, God never ceases to amaze me!" She went on to explain that over the course of three years, she'd suffered from six light strokes and that, because she also suffered from diabetes and other maladies, she had taken what's known as "continuing disability" status as a pastor. She was no longer physically able to do parish work day-in and day-out. She went on to explain though, that she had missed working with youth so badly, that she was now tutoring students part-time in a local school system, in addition to filling in for pastors who had to be away from their congregations on Sunday mornings. Beside dealing with her own issues, she also is helping her mother, no longer able to drive after suffering from her own more serious stroke several years ago. It's possible that God planted X's name in my brain, knowing full well that she needed help and seeking the invitation of some intercessor on her behalf. (In fact, I believe that God did exactly that!) South Korean pastor, David Yonggi Cho, has said that "the Holy Spirit is a gentleman," meaning that God never forces Himself into any situation. Like the anxious underclassman on the sidelines of a football game who begs, "Send me in, Coach," God wants to be invited into our world and into the lives of people to bring wholeness, healing, comfort, guidance, and hope. The Bible makes it clear that prayer isn't really something we do at our initiative. Unbeknownst to us, our prayers really start with God's Holy Sprit. Paul writes in Romans, "...we do not know how to pray as we ought, but that very Spirit intercedes with sighs too deep for words. And God, Who searches the heart, knows what is the mind of the Spirit, because the Spirit intercedes for the saints according to the will of God" (Romans 8:26-27). But even if you can't believe that the thought of that nearly-forgotten name flashing across your brain as you wake from a nap was put there by God, what harm can there be in responding to that strange occurrence by offering a simple prayer, something like, "Lord, in the Name of Jesus, help X"? It can't do any harm and it just might do some good. Here. I have always said that, as a Christian, irrespective of how I may view the practice of homosexuality as a matter of right and wrong, all people should have equal rights under civil law. HB176 seeks to guarantee equality in housing and employment. I know nothing of its details, but can't find its ends objectionable. The bill now goes to the State Senate. Where is the Right Right Now? And can it be righted? Being perceived as only being against things is not a winning political formula; the Democrats have been taught that lesson many times since the 1970s. Conservatism seemed to break away from its philosophical moorings four years ago, anyway. Over the past several weeks, our second Bible lessons have been drawn from the New Testament book of James. James is a book that challenges us to consider how we live out our faith in Jesus Christ, particularly within God’s only eternal family, the Church. In today’s second lesson, James addresses a very practical issue for Christians and the Church: How we use the gift of communication and speech. Or, how we use our tongues, as James would put it. James was appalled at how Christians could use their mouths to praise God in worship one moment, pray to God for blessings the next, and then use those same mouths to run down other people who, just like us, are made in the image of God and for whom, also just like us, Jesus died and rose. James isn’t concerned with the innocent mistakes made by people like little Craig Eshbaugh when he told a caller that his mom was making babies nor was he talking about the things we say that emanate from innocent ignorance. Instead, James is talking about the deliberate use we make of speech that rips people down, that passes on gossip, that lifts us up at the expense of others, or that hurts the fellowship of the Church in which Jesus commands us to love one another as He has loved us. In short, James addresses speech that dishonors God. He minces no words about the destruction wrought by our words or where their destructive power comes from. In Medieval times, a woman visited a monk. He was a man admired for giving holy, sensible advice. The woman realized, she said, that she had become a terrible gossip, the purveyor of hurtful words. She wondered what she should do. The monk told her to go through the village and bag all the goose feathers she could find. Then, she should lay a feather at the doorstep of every person about whom she had gossiped. After that, she should return to the monk. The woman dutifully did what the monk directed her to do and returned to him. The monk said, "That's great. Now go back to each of those doorsteps and collect the goose feathers you left behind. Then, come back here." When the woman returned for yet another visit to the monk, she reported that all the feathers had been blown away by the wind. "That’s the point, of course," the monk told her. "We can be forgiven the sin of gossiping about others. If you repent for it, God surely will forgive you. Those you have violated may do the same. But no matter whether you are forgiven or not, the damage will have been done. Gossip spreads as though carried aloft by the wind and you can't bring it back. So, be careful about what you say." When I look at my life, I find that almost every problem I’ve ever experienced has been caused by my unwise speech, words used that denigrated or damaged others, words that told half-truths, words that conveyed hurtful speculation about the character or motives of others. I’ve repented for those things. But I realize that the damage done, like a bell that can’t be unrung, can never be reversed. In his explanation of God’s Eighth Commandment, “You shall not bear false witness against your neighbor,” Martin Luther writes in The Small Catechism, “We are to fear and love God so that we do not betray, slander, or lie about our neighbor, but defend him, speak well of him, and explain his actions in the kindest way.” Not only are we not to lie about others, we’re to put the most positive spin on their actions and motives that we can. (And that includes what we say about politicians in Washington you and I will never meet!) If we love the God Who loved us all the way to the cross, we’ll take the call to the right use of our words seriously. But how do we do that? Here are a few thoughts from one recovering mis-user of speech to another. Finally, I want to say a word to all of you who, like me, have already scattered too many goose feathers to the wind. It can be appropriate for you to apologize to the people who have been hurt by your intemperate words. Although I must say, I don't feel fanatical about this. In my former parish, a woman told me that just the week before, she'd gotten a call from a man she'd dated forty years earlier. He wanted to apologize for something she had long forgotten from that period. But what’s most appropriate when we misuse the gift of speech to run others down is to ask God for His forgiveness and for the power to keep our tongues under His control in the future. Proverbs 22:1 says, “A good name is to be chosen rather than great riches, and favor is better than silver or gold.” Those of us who are saved in the Name of Jesus Christ choose each day whether we will honor Christ’s Name or not by deciding whether we’ll care about the names and the reputations of others as though they bore our own names and reputations.